Washington, D.C.-based artist Stephanie J. Williams delivers the opening lecture in the Wriston Art Center Galleries’ latest exhibition Friday, Sept. 27 at 6 p.m in the Wriston auditorium. The new exhibition runs through Nov. 27. A reception follows Williams’ remarks. Both events are free and open to the public. 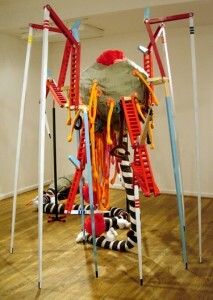 Williams explores themes of body topography, play, home and pose in her installation “Homegrown” in the Kohler Gallery. 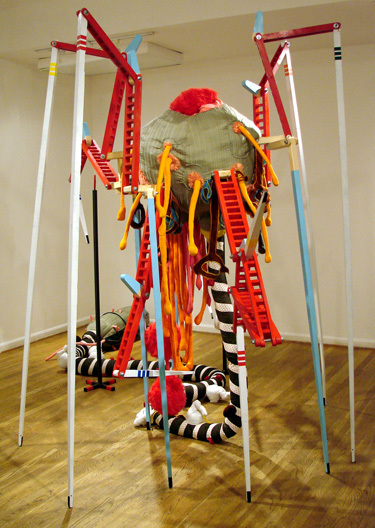 Her work focuses on reconfiguring the familiar into alien territory. Through changed context, disparate parts become exotic objects allowing the viewer to look at what is uncomfortable to see and have accessibility to anomaly. The Leech Gallery features works from the Wriston’s permanent collection as well as copies of fashion plates from Europe and America in “Capturing Modernity: Art, Fashion, and Artifice.” Curated by associate professor of art history Elizabeth Carlson, the collection examines the correlation between turn-of-the-century fashion and emerging modernity. Sculptor Alison Stehlik’s installation “Where-House” in the Hoffmaster Gallery, explores the relationship between the architectural space that is a home and the products and possessions that fill that space. In a society where packaging and branding seem to supersede the structure of the home, Stehlik’s work confronts the viewer with the possibility that our attachment to the objects within our home exceeds our connection to the actual place in which we live. Wriston Art Center hours are Tuesday-Friday from 10 a.m. – 4 p.m., Saturday-Sunday from noon – 4 p.m. The galleries are closed on Mondays. For more information, call 920-832-6621.